Print Concierge can print your carbonless books in various standard sizes (DL, A6, A4, A5 and A3). 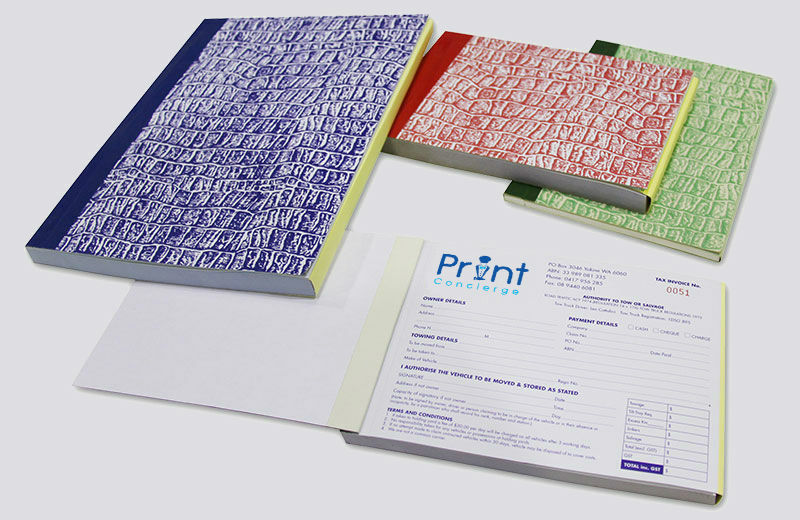 We can also print in custom sizes and print using custom front covers for that added branding. The carbonless books can be printed in either duplicate (2 sheets per set), triplicate (3 sheets per set) or quadruplicate (4 sheets per set). Each set is usually printed using a common image or artwork. If you require different artwork to be printed on each separate set, Print Concierge can cater for that as well. All books are quarter-bound with a colour crocodile board and tape, plus a wrap cover. Carbonless books can be printed 1 sided, 2 sided, or a combination of both. Our customers have the choice of printing in black only, spot colours or in full colour (CMYK). We will even let you select the colour of the crocodile board and tape!